Thrilling, uplifting, action packed, larger than life… these are all adjectives often used to describe the Marvel comic book recently turned blockbuster movie smash Black Panther. First written by Marvel comic book titan Stan Lee, and artist Jack Kirby in 1965, it took all these years to finally bring the popular comic to life on the big screen. After years of brainstorming and negotiations with several top writers and directors, Lee finally joined forces with Fruitvale Station and Creed director Ryan Coogler to take on this epic undertaking. Viewers show their excietement at Black Panther premier with this South African Wololo dance. For those not familiar, the story follows African prince T’Challa’s journey to the throne of the futuristic, African country of Wakanda. First making his debut in a Fantastic Four comic in 1966, T’Challa/Black Panther finally made his cinematic live action appearance in 2016’s Captain America: Civil War. Olabisi dance ensemble perform West African dances accompanied by live drummers at Black Panther premier in Las Vegas. This is more than just another movie. It offers so much in terms of visual imagery, as well as weaving in historical Easter eggs alongside the contrasting futuristic themes. This is a cinematic masterpiece at its finest in its storytelling, teachable moments, and themes of empowerment, which re-appear throughout the movie. Lone fan performs a funky house dance style in fully masked Black Panther costume at his local theater. As the buzz around the film reaches a fever pitch, pre-sales for first showing sold out weeks, in some cases months in advance. The film broke many early box office records with the fastest pre-sales, and even became one of the top five Fandango pre sales. With a 95% score on Rotten Tomatoes, Black Panther has done what most movies fail to do – which is please the critics as well as global audiences across all demographics. Elementary school kids at Ron Clarke Academy perform spontaneous dance in celebration of the news they have received free tickets to go see the premier of Marvel’s Black Panther. 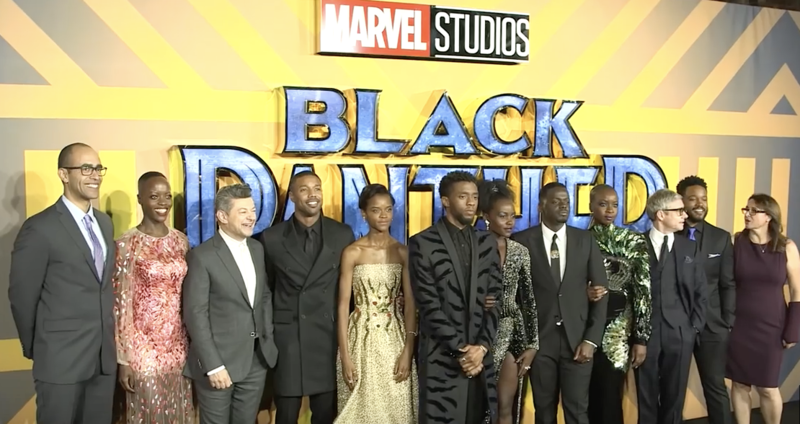 Moviegoers from LA to London, and from Cape Town to South Korea all dawned upon theaters dressed up in Panther masks and body suits, with others dressed in traditional African garb such as dashikis, kente cloth and wraps and more. Some people even dressed up as iconic characters from other classic films like Coming to America, where actor James Earl Jones dawned a full lion skin with head attached (displaying his wealth and status). Men dance the shaku shaku in the middle of a congested Lagos, Nigeria street in honor of Black Panther. Most audiences have left Black Panther expressing a sense of hope, excitement, pride and overflowing joy. So much in fact that the web is exploding with viral videos of Panther fans performing special dances at premiers worldwide; some in full costume. Imagine being so moved by a film that you leave the theater inspired to create positive change in the world, as well as get up and dance! Black Panther dance infused with a South Korean style.